Steven Matz, the Mets starting pitcher, stepped off the mound Tuesday night and began walking to the visiting dugout when he heard an unlikely noise. The Phillies fans at Citizens Bank Park, often quick to greet opposing players with disdain, were cheering for a Met. It wasn’t just polite cheers for Matz, but a standing ovation. The pitcher’s night was finished, and his work, at least in South Philadelphia, was met with much appreciation. That is what happens when a visiting pitcher gets torched for eight first-inning runs without recording a single out. It was easy Tuesday night — as the Phillies rolled to a 14-3 win — to cheer for the player wearing blue and orange. The Phillies scored 10 runs in the first inning, sending 14 batters to the plate, facing two pitchers, and watching the Mets commit three errors. The rally came a night after a difficult loss, and the Phillies wasted little time working out their frustrations. “That was probably the craziest first inning I had ever been a part of,” said J.T. Realmuto, who drove in four runs on two doubles in that frame. Scott Kingery and Maikel Franco each hit three-run homers in the first. The Phils’ first eight batters all reached base and scored before the first out of the inning. The rally, which seemed like it would never end, took 30 minutes. Matz faced the Phillies four times last season and allowed nine runs in 17 innings. He nearly equaled that total Tuesday, when he faced eight batters and allowed eight runs. He became just the fifth starting pitcher in baseball history to allow eight or more runs without recording an out. It was the first time since 2005 that a pitcher was removed allowing eight runs without an out. The Phillies’ onslaught was without Rhys Hoskins, who was held out of the lineup with a sprained ankle. Jean Segura doubled in his first at-bat but suffered a hamstring injury when he grounded out for the second out of the inning. Kingery and Realmuto each finished with five RBIs. Bryce Harper scored three times. Andrew McCutchen scored twice. Manager Gabe Kapler said before Monday’s game that he was looking for ways to find Kingery additional playing time. He had a good weekend in Miami and was forcing his way into the lineup. That aggressiveness was apparent on Tuesday, when he jumped on the first pitch and slammed a three-run homer to left field. He drove in two more runs in the fifth, blistering the second pitch down the third-base line for a double. He altered his swing this winter for a “flatter” stride through the zone. But more importantly, he said, is the confidence he gained from struggling last season. 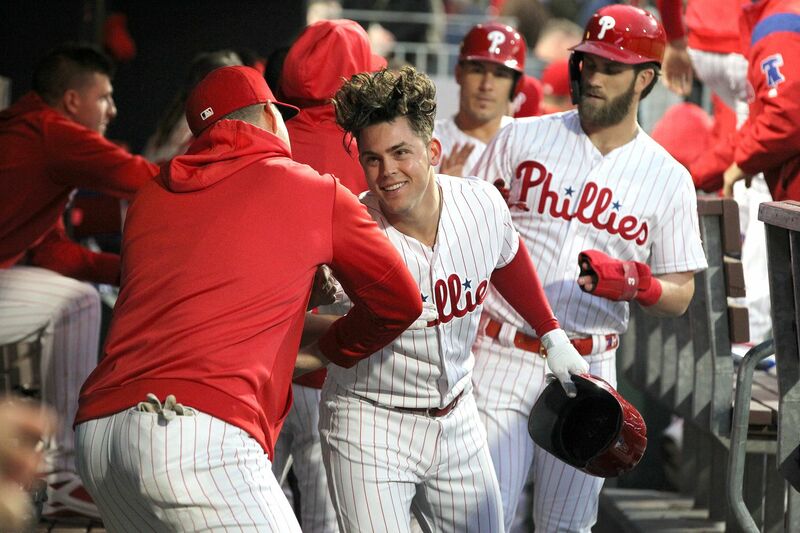 Scott Kingery, right, of the Phillies is congratulated by Bryce Harper, left, and JT Realmuto after hitting a 3-run home run off of Steven Matz of the Mets in the 1st inning at Citizens Bank Park on April 16, 2019. The 10-run inning was enough of a cushion for Nick Pivetta, who allowed three runs in five innings but did little to ease concerns about his season. He needed 100 pitches, and each inning was laborious. Jerad Eickhoff, who arrived in the afternoon from triple A, pitched four shutout innings in relief. Eickhoff, flashing a strong curveball, struck out five, held the Mets to three hits, and earned a rare four-inning save. The Phillies scored a ton of runs, but they still have questions about the rotation. Pivetta will still claim a spot, but Eickhoff showed that he can handle a start when needed. It was the Phillies’ biggest first inning since they scored 12 runs in 2017 against the Nationals. Washington’s starter that night — Jeremy Guthrie — was forced into retirement after that game. Drew Gagnon finished the inning for Matz, but first the Phillies tagged him for two more runs. Kingery’s homer gave the Phillies a five-run lead. They were halfway through their big inning when he touched home plate and returned to the dugout as teammates threw sunflower seeds into the air. The fans were on their feet, and Matz watched from the mound. It would not be long before he, too, would hear those cheers. Maikel Franco, right, of the Phillies is congratulated by Bryce Harper after Franco's 3-run home run against the Mets at Citizens Bank Park on April 16, 2019. The Phillies scored 10 runs in the 1st inning.